Our data this year have proven the rumors true regarding the ever-increasing rent cost in our beloved New York City. Now, more than ever, we find companies are willing to pay top dollar for the best space. We sent our top deals to Gus Delaporte at The Commercial Observer. Read below. In the exclusive confines of the Plaza district, a handful of elite financial services firms spent 2013 inking triple-digit leases—those deals carrying rents in excess of $100 per square foot. Once rare, these deals have skyrocketed in those few buildings boasting the unique infrastructure requirements for the world’s top money managers. From Aby Rosen’s landmark Seagram Building to Sheldon Solow’s 9 West 57th Street, the triple-digit fraternity is an exclusive club for both landlord and tenant. Approximately 60 leases fell into the triple-digit category in 2013, the bulk of them signed during the second quarter, according to data from CompStak. 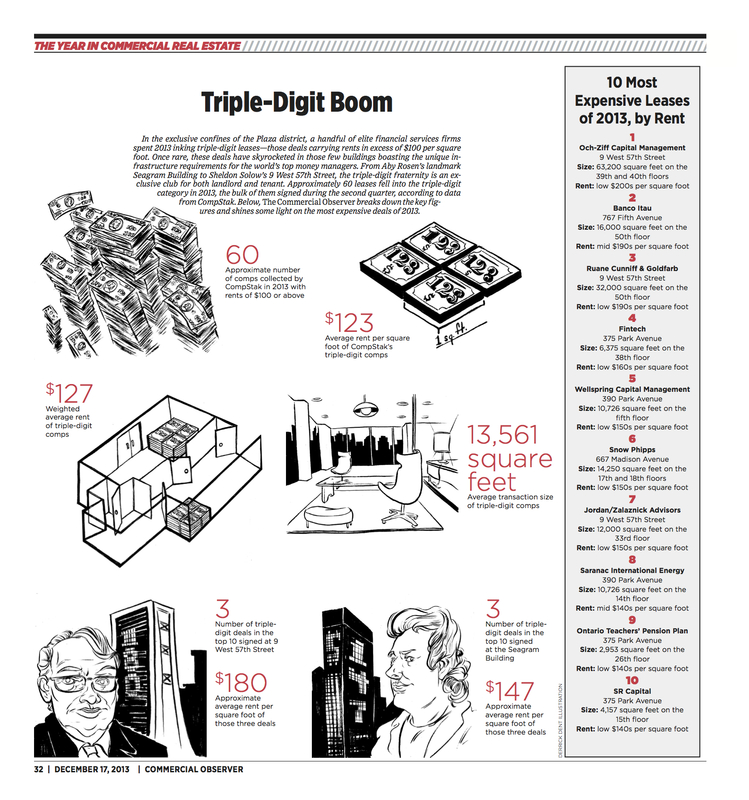 Below, The Commercial Observer breaks down the key figures and shines some light on the most expensive deals of 2013.